A brief look at my skill range. Infrastructure development, website development, mockup to website conversion, search engine optimization, analytics/reporting, content management systems, databases, web application programming, ecommerce development, user experience design, accessibility enforcement, technical documentation production, and security remediation. AWS: Elastic Beanstalk, Relational Database Service, EC2, S3, etc. 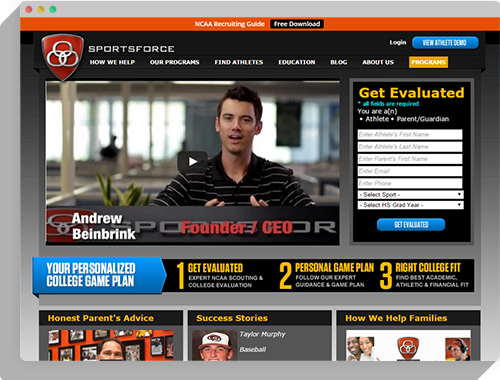 SportsForce needed a solution to index their athlete profiles on search engines. I was able to provide a budget-friendly solution in a timely manner that increased their indexed pages 50 times over. A custom php script was implemented with their existing MySQL database as an automated solution. We began with a mobile-first approach to site interaction as well as image presentation to the visitor. We resulted in a clean experience with a focus on Hugo's work that increases and evolves. thank you for your time. lets connect.